Heading into Buffalo, Denmark is in the midst of four straight World Junior Championship appearances. They are coming off of their finest performance thus far after they took Canada by storm at last year’s tournament. In 2017, they put Finland to bed in their second game of the tournament, 3-2. They scared the living daylights out of the Czech Republic by defeating them 3-2 in OT. Then Denmark nearly knocked off Switzerland, before losing 5-4 in a shootout. In the process, they finished second overall in Group A. Though Russia got the better of them in the opening round of the quarterfinals, the Danes showed that they are a country to be reckoned with. The question becomes, what do they have in store for the hockey world in 2018? Another wild, almost gonzo, performance where they did away with seemingly better teams? Could this year bring a legitimate shot at a medal? Eight players could potentially make this year’s final roster from their 2017 squad. Two of them are goaltenders, with the one having some of the best numbers of any goalie at last year’s event. So Denmark has that going for them. The other feather in their cap is that the veterans are flanked by a satisfying addition of youngsters. THW breaks down how Denmark’s roster ought to take shape. The starting goaltender for Denmark is bound to be Kasper Krog. He appeared in three games for the Danes in 2017. That includes the win over Finland and the shootout loss to Switzerland. In the shootout game, Krog made 48 saves on 53 shots. While his goals-against average for the 2017 tournament looks relatively high at a 3.27, his .920% save percentage was third-best of any goalie at the tournament. At 5-5-foot-9 and 176 pounds, Krog is smaller but very agile. More importantly, he has admirably proven himself at the WJC. He will be enjoyable to watch here in 2018. Emil Gransøe was also a member of last year’s Denmark team but he did not see any of the action. He has played junior the past two years with the Topeka Roadrunners of the North American Hockey League (NAHL). Gransøe’s numbers have not been then great, but it may just be a matter of perspective. His GAA for last season and this current one in Topeka have been 4.19 and 3.48. In comparison though, Gransøe’s SV% has been fairly decent at .906 and .910, respectively. The third option for the Denmark net is Mads Søgaard. Like Gransøe, Søgaard is a product of the NAHL. He has played in 10 games for the Austin Bruins, posting a 3.01 GAA and a .901 SV%. Søgaard also has also received some accolades back home, including twice being named Denmark’s best goaltender at the U17 level. What is enticing about giving Søgaard a shot is that he is a heck of a big goalie. All 6-feet-6-inches of him on a 190-pound frame. Krog should get the bulk of the duties, but do not be surprised if Søgaard is given a shot to showcase his skills, and his size. Born on Christmas Day, defender Oliver Joakim Larsen will be able to celebrate his birthday in style by indulging in World Junior competition in Buffalo. Larsen is the only defender from Denmark’s 2017 team making the return for this go-round. At 6-foot-3 and over 200 pounds, Larsen is a strapping D-man for the Danes and will be one of their steadiest. In five games in Canada at last year’s tournament, he picked up a lone assist. Larsen has been a mainstay on defense for Denmark in international competition for a number of years now. Malte Setkov is a giant-sized defender for the Danes. He is also a fourth-round selection of the Detroit Red Wings from this past summer. Standing 6-foot-6, Setkov has spent much of his hockey career in Sweden playing for the Malmö Redhawks program. While he did see action in one Swedish Elite League game so far this season, he has played mostly J20 SuperElit which is the top junior league in Sweden. Setkov’s size is too great to pass up. Detroit certainly did not, and Denmark should not either when they make their final roster cuts. Jakob Jessen plays for Herning Blue Fox in the top hockey league in Denmark. He has been solid through 23 games this season for the club. Jessen’s plus/minus is a respectable plus-four, and he has scored a goal and three assists. Jessen is also one of only two defenders in the Denmark camp who is under six feet tall. The other possible selections on defense for Denmark are: Jeppe Mogensen, Lasse Carlsen, Lasse Holm Mortensen, Rasmus Birk Heine, and Christian Larsen. There is anything and everything to like about Nikolaj Krag-Christensen. The St. Louis Blues know that—they made him a seventh-round selection in 2016. Krag-Christensen has wonderful size at 6-foot-3 and 200 pounds. He can produce too – during last year’s World Juniors, Krag-Christensen had a pair of goals and a pair of helpers in five games for Denmark. This will also be his third and final World Juniors – a feat that has become more of a rarity in recent years is for a player to participate in three such tournaments. If you intend to root for Denmark, then you will most assuredly take a liking to Krag-Christensen. Maine Black Bears commit Jacob Schmidt-Svejstrup will be one of Denmark’s more exhilarating players for Team Denmark. Maine has developed a penchant for bringing a lot of European players into both their men’s and women’s hockey programs. Schmidt-Svejstrup, who looks to start as a Black Bear in 2018-19, is one of their best prospects. Last year in 26 games for the NAHL’s Coulee Region Chill, he tallied 15 goals and 12 assists. This year, Schmidt-Svejstrup has been with the United States Hockey League’s (USHL) Fargo Force. With Fargo, he has put up 17 goals and 13 assists for 30 points 23 games. Denmark can be confident that Schmidt-Svejstrup’s production will continue in Buffalo. One other Dane who will make a big splash will be Joachim Blichfeld. 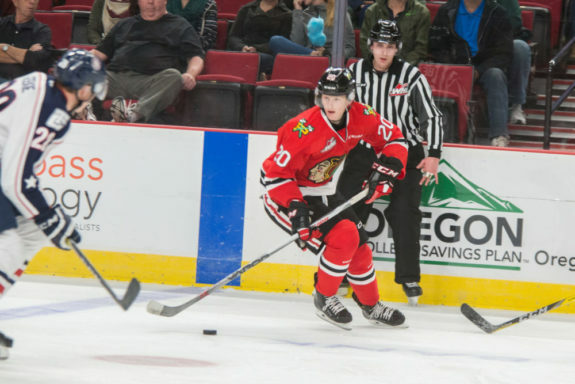 The seventh-round selection of the San Jose Sharks in 2016 has been lighting it up with the WHL’s Portland Winterhawks. Between last season and this one, Blichfeld has played in 89 games for Portland and has registered 88 points. He was also on the 2017 Denmark team and had three goals and an assist in five tournament games. Blichfield may very well be the best forward on this team. The other possible choices at forward for Denmark are Andreas Grundtvig, Phillip Schultz, Lucas Andersen, Asger Petersen, Magnus Molge, Oliver True, Christian Mathiasen, Valdemar Ahlberg, Jonas Røndbjerg, Daniel Nielsen, David Madsen, and Christoffer Gath. Of course, Røndbjerg is a third-round selection of the expansion Las Vegas Golden Knights, and is also pretty much a given to make the Denmark team. Denmark has much finer offense than what most World Juniors enthusiasts may realize. Blichfeld, Krag-Christensen, Schmidt-Svejstrup, and Røndbjerg each pack a punch and make for some legitimate scoring from the Danes. They are also a difficult team contain both in terms of speed and with regards to size. A player like Asger Petersen is 6-foot-5 and well over 200 pounds. The forward corps are really where Denmark’s strong suit is at, and because they are potent there is a good chance that they can provide the offense to steal games from teams are deemed better all-around. The most positive aspect of Denmark’s defense is their size. With the exception of Lasse Carlsen who is only 5-foot-8 and not even 150 pounds, the rest of the D-men are hulking. Denmark will also need Krog to be at least as good as he was in 2017, but preferably even better. Defense: Malte Setkov, Oliver Joakim Larsen, Jakob Jessen, Lasse Carlsen, Lasse Holm Mortensen, Rasmus Birk Heine, Christian Larsen. Forwards: Jacob Schmidt-Svejstrup, Oliver True, Nikolaj Krag-Christensen, Joachim Blichfeld, Magnus Molge, Valdemar Ahlberg, Andreas Grundtvig, Lucas Andersen, Asger Petersen, Christian Mathiasen, Jonas Røndbjerg, Daniel Nielsen, David Madsen.